It is this time of the year again. The world’s largest game convention – Essen Spiel – takes place in Germany this October 26-29 and Days of Wonder is debuting a new expansion for Ticket to Ride there. 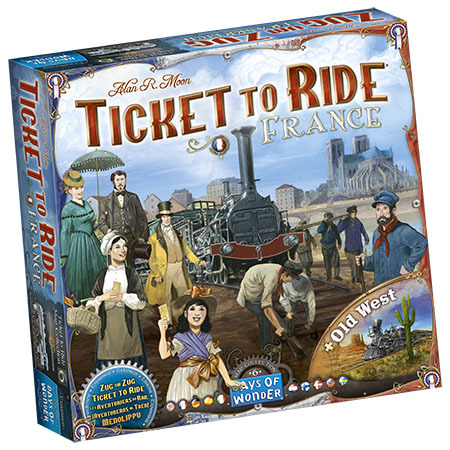 Ticket to Ride: France the biggest expansion yet released. Dive into thriving French culture during the height of Impressionism and the Industrial Revolution: street cafés, “Starry Night,” Paris boulevards, and Notre-Dame. The French railroad system is a blank canvas just waiting for competitors to make their masterful strokes. If you feel adventurous, you will also have the opportunity to conquer the sky with Small World: Sky Islands. In this newest expansion for Small World, new lands are floating closer, but the world remains too small—and that’s not going away with the new board featuring the floating Sky Islands. If you haven’t be lucky enough to play Yamataï yet, it’s your chance to try to impress Queen Himiko by building the most prestigious city of the kingdom! If you are in Essen, make sure to visit us at the Days of Wonder booth and to check the schedule Julien Delval (Illustrator of Ticket to Ride, Memoir ’44) will be present at some point on Saturday and Sunday to chat with you and sign copies of the games! We will be located in Hall 3, Booth 3B107. Our games will be available for sale from the Asmodee Store right across the alley (Booth 3B108). This entry was posted on Monday, October 16th, 2017 at 10:38 and is filed under Events, Games, News, Small World, Ticket to Ride. You can follow any responses to this entry through the RSS 2.0 feed. Both comments and pings are currently closed.